TORONTO - Ontario's auditor general is sounding the alarm about the province's ballooning debt in her annual report, warning that it continues to grow faster than the province's economy. In her 600-page annual report released Tuesday, Bonnie Lysyk cautioned that despite Ontario's work to eliminate its deficit, the province's rising net debt — the difference between its liabilities and its total assets — could have a number of negative implications for its finances in the future. Ontario's majority Liberal government has pledged to eliminate its $12.5-billion deficit by 2017-18. But by that year, the province's net debt will have soared to $325 billion — more than double the $156.6 billion a decade ago, Lysyk's report estimated. "To put this in perspective, to eliminate Ontario's 2017-18 estimated net debt, every man, woman and child in Ontario would need to contribute $23,000 to the provincial coffers," Lysyk said in her report. The negative implications of a large debt load include debt-servicing costs diverting funding away from other government programs, greater vulnerability to interest rate increases and potential credit-rating downgrades which could lead to higher borrowing costs in the future, the report stated. To put those implications into perspective, Lysyk's report pointed out that the government now spends more on debt interest than it does on post-secondary education, and those interest costs are growing. "Our commentary on Ontario's increasing debt has attracted little public attention. 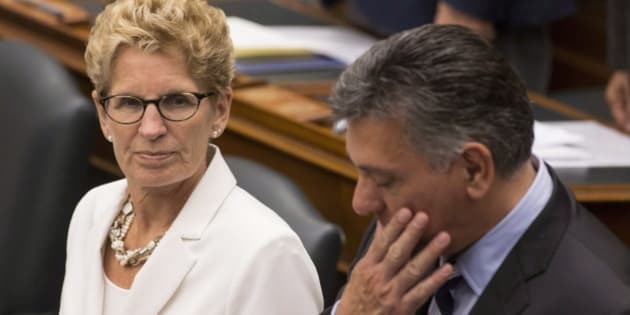 We believe one reason for this is primarily because of the focus placed on first eliminating Ontario's annual deficit," Lysyk wrote. "Ultimately the question of how much debt the province should carry and the strategies that would be used by the government to pay down its debt is one of government policy. However, this should not prevent the government from providing information that promotes further understanding of the issue." In particular, Lysyk's report recommends the government provide more information on how it plans to achieve its target of reducing its net debt-to-GDP ratio to its pre-recession level of 27 per cent. The provincial net debt-to-GDP ratio — a key indicator of the government's financial ability to carry its debt relative to the size of the economy — is projected to reach a high of 40.5 per cent in 2015-16, after which the government expects it to decline, the report noted. Ontario's net debt was more than $267 billion at the end of March, the report noted. The figure has been rising in recent years due to government borrowing to finance deficits and increased spending on infrastructure, Lysyk found. "While annual deficits are projected to decline, the province will still be increasing its borrowings annually to finance these deficits, to replace maturing debt and to fund public infrastructure projects," Lysyk wrote. "In fact, net debt and total debt are both expected to continue growing in absolute terms even after the province starts to run annual budget surpluses. This important fact should not go unnoticed by members of the legislature and the public." The province can only begin paying down its debt when future surpluses provide cash flows "over and above" what's required to fund government operations and its net investments in capital assets, the report said.